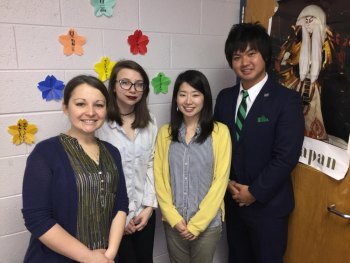 HUNTINGTON, W.Va. – Marshall University has partnered with Huntington High School and initiated a new Japanese sister school program to allow more students learn the Japanese language and more about Japanese culture. The efforts have been led by Shintaro “Shinn” Takase, a Japanese outreach coordinator appointed to Marshall University through a grant program from the Laurasian Foundation in Japan, and Dr. David Pittenger, interim associate vice president for outreach and dean of graduate studies. With their help, Japanese students at Huntington High have developed a sister school program linking them with students at Yokosuka High School in Japan. The program has helped the American students improve their Japanese language and cultural education and the Japanese students improve their English while learning about American culture. Beginning in January 2018, students at both schools started sharing general information about themselves. The assignment allowed students to write in a foreign language and learn about fellow students in another country. They will continue to learn through collaborative projects such as the creation of videos of introducing daily school scenes, town, food, stationary, or writing and sending the letters to each other. Meagan Joseph, a 2014 Marshall University graduate, teaches Japanese at Huntington High School and said her students are already invested in the relationships they’re building. “Every day the students ask, ‘Have we heard from our sister school today?’” Joseph said. “When our students here at Huntington High read the information cards of the students from Yokosuka High School, they immediately began making connections, not just about themselves, but to their cultures at large. Helping Joseph teach the class has been Kei Yamaguchi, who has been assigned to Huntington High School by the Japanese Language Education Assistant Program, a program to promote Japanese language education in K-12 schools in America and other countries. Sho Kato, who teaches English at Yokosuka High School in Aichi prefecture, Japan, said he greatly appreciates Takase’s efforts in establishing the new partnership. “We are certain that both students in Japan and the U.S. [will] learn various cultural differences through this program, and this opportunity will surely make students want to study languages harder and help think about their future,” he said. Takase is thrilled to help, though it wasn’t necessarily an easy start-up, he said. For more information, visit https://www.laurasian.org/jleap/ or https://www.laurasian.org/joi or contact Takase by phone at 304-696-8881 or by e-mail at takase@marshall.edu.